A file copied from a location, such as a network share, CD or DVD, that is read only has the read only attribute automatically set after being copied. This flag turns that setting off once the file has been copied to the target folder. This means you can make the FE database file server folder read only for users. Note that this option resets all the attributes although most of them won't matter to anyone using the Auto FE Updater. These attributes are hidden, system, archive and temporary . (I never knew there was such a thing in NTFS as a temporary file.) If this is a problem let me know and I'll work on the code. 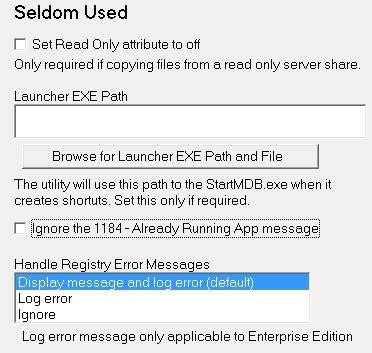 The utility will use this path to the StartMDB.exe when it creates shortcuts. In some unusual situations VB will convert the path it creates in the shortcuts from drive letter to UNC format for processing purposes. Thus the shortcuts created have UNC paths in them when you want drive letters. The utility is now checking the target folder to see if an LDB/LACCDB file is present. This means that the user is very likely already running your Access application. The problem that can happen that if a user is already in the FE database file and if the Auto FE Updater utility needs to copy down the new FE database file over top the old one. Bizarre things can happen. This check box ignores the LDB/ACCDB file checking and allows the user to run a second copy of your FE database file. Note that if this is a one time problem have the user log off and back on to their system. This will clear all existing tasks including Access if it's "hidden" in the background. Some items in the Auto FE Updater will update the registry. 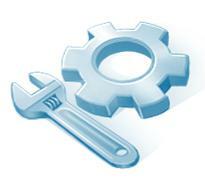 This check box helps to customize handling any errors that might occur.